If you are looking for training tips to improve you and your horse’s performance, then Horse & Hound is here to help. Our training area includes videos and written advice to help riders across the disciplines at all levels. 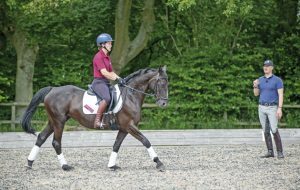 Whether you are a dressage rider looking to pick up those vital extra marks, a showjumper struggling with jump-offs or an eventer looking to eliminate those annoying time penalties on the cross-country, we have something for you. We pick the brains of top riders and trainers across the disciplines to find those training gems that can make the difference between winning and being an also-ran. And there isn’t only advice for competitive riders, we also have advice on topics such as rider fitness and coping with nerves which every rider can benefit from. As well as reading advice from top riders and trainers, you might also like to discuss training and competing in the H&H forum with like-minded individuals. You need to register in order to join in the discussion, but it’s free to do so. If you’re struggling with a training issue and can’t find anything to help when you search our site (use the magnifying glass top right to search), then let us know by email and your issue might become the topic of our next training feature. Belly bands: what are they and should I use one on my horse?